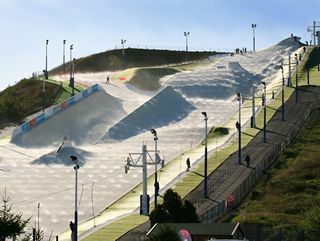 Lynchburg, VA – A portion of Liberty University’s 5,000-acre mountain range will be receiving a makeover in the coming months with the construction of a year-round ski slope to be known as the Liberty Mountain Snowflex Center. The idea of building a snow-free ski slope on Liberty Mountain began three years ago when the university hired Alpentech Inc., a Salt Lake City, Utah consulting firm, to investigate several ways the school could use its mountain property to meet Liberty’s academic, financial and recruiting goals. In addition to giving students more recreational, physical education and fitness opportunities on campus, the slope will help establish skiing and/or snowboarding as Liberty University (LU) club sports. One hundred percent of the slope’s cost is being funded by a charitable donation to the university. While the future slope will be available to the public, students will receive priority in both pricing and usage. Upon completion, the 110 vertical-foot artificial snow sports incline will be the first in the U.S. surfaced with Snowflex, a synthetic material designed to simulate snow. The Discovery Channel is documenting the event and will air several phases of the construction on a future episode of Daily Planet. Invented in 1993 by Brian Thomas of Briton Engineering, Snowflex originated in the U.K. and has been installed in several facilities throughout Europe. This innovative technology features small, built-in misting devices that lubricate the slope’s surface, recreating the slip and grip of real snow. The Liberty Mountain Snowflex Center will consist of a main ski slope and a beginner slope for ski and snowboard instruction, totaling about 40,537 square feet of skiable area. Jumps and additional features on the main slope include a tabletop, a big kicker, an 11-foot high quarter pipe, two grind rails and an tube chute. Those who prefer tubing may do so at designated times. A ski lodge will also be installed, permitting parties and other special events. Construction is slated to begin late August or early September with an anticipated grand opening around the start of the new year, 2009. “There are no beer bashes at Liberty, and no coed dorms, but it doesn’t have to be a monastery. We’re breaking the stereotype that Christian education is synonymous with boredom,” said Falwell.